Where there is flux, I search for continuity. Perhaps that's why I've decided to focus on Kazimir Malevich and Supermatism right now. As everything around me seems to be changing, I'm really feeling the common thread throughout Malevich's work. Malevich was a Polish artist living in the former Soviet Union. Born in modern day Ukraine in 1879, he worked at a pivotal time in modern art history. Striving to further the abstraction of reality achieved by Cubism, Malevich created his own art movement he called Supermatism, publishing a manifesto, From Cubism to Supermatism in 1915. The term 'supermatism' was used because his aim was to achieve a sort of purity in the pictorial arts that would be superior to other art forms both in feeling and perception. Drawing upon the theories of the Formalists, literary and poetic critics in Russia who worked contemporarily with Malevich, the artist adapted notions of defying reason, pairing down to the essential elements of an artist's work. This took Cubism a step further, to very basic geometric shapes. Through simple shape, Malevich was able to make an image, because the shapes were painted against a background. The relationship between the background and the geometric forms atop then created a sort of tension, which Malevich hoped would elicit pure feeling, devoid of logic and reason. The idea was to create illusions: with two dimensional space, three dimensional perspective, and infinity as an abstract concept of time and space. Through this, Malevich felt he was able to create things that had never existed before. Citing Eastern Philosophy in his writings and mentioning god-like feelings during his work, Malevich had an undertone of mysticism behind his theories, which were contrary to both his Catholic upbringing and the atheistic views of Communist Russia. 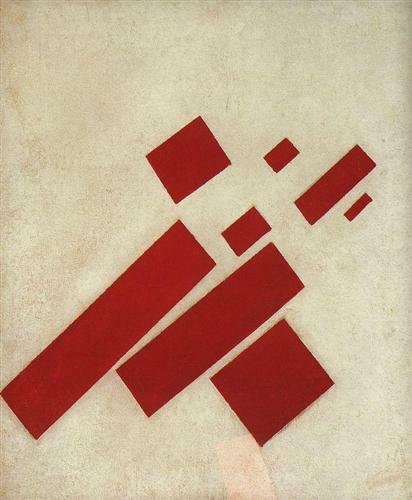 Working between WWI and WWII, Malevich's work was met with tension by the Soviet Communist Party. Beginning his career under Stalin and Trotsky, Malevich started his work during a time that has been called a "period of open idealism." Partly because of this timing, his work was recognized by the West, with his first solo exhibition in Berlin in 1927. But once Stalin took over Russia, all art was to be educational, so Malevich's work was confiscated for being "bourgeois," and he was prohibited from creating or exhibiting any longer. Malevich responded by saying, "Art can advance and develop for art’s sake alone. Art does not need us, and it never did.” For this, Malevich was taken to prison in 1930. When he was released six months later he was given the options to either leave the country, never show anyone his work again, or he could become a realist painter. Though he was radical in his views, Malevich did try to appease his government by attempting a few realist paintings, and while the outcome was good, working in this style was short-lived. Having been forbidden to work as a Supermatist, Malevich left painting to design tableware and clothing until his death in 1935. Despite the controversy around Malevich's work, mourners were permitted to wave his Black Square on a banner at his funeral. His ashes were buried beneath an oak tree, and a sculpture of his Black Square was placed as headstone. Malevich, in his mystical fashion, had requested that a telescope be mounted to one of his sculptures to be placed at the base of an oak tree (a specific tree he had said he felt connected to) so that visitors could view Jupiter, but this wish was unfulfilled. And perhaps for the better, because the entire memorial was sadly ruined during WWII. Apparently his family was compensated with a pension after the war, and then in 1988, a building on the original burial memorial was erected in his honor.